Pawol mwen: Do you know about the Haitian dollar? Do you know about the Haitian dollar? - It'll cost you 50 000 gourdes. - Excuse me, how much money does it make? To readers who live in Haiti for some time, there is some evidence that here our two parties do not speak of the US dollar. For those who are plugged world exchange rates news, it is also clear that our two parties are not talking about the gourdes and US dollars. For other people reading this article, no need to grind your brains too long, I tell you right now, currencies in question here are the gourde and the…. Haitian dollar. We all know that the gourde is the Haitian national currency so where does this Haitian dollar that commonly occurs in everyday life's transactions, comes from? For many, this phenomenon appeared after the international monetary system is moved from a fixed exchange rate to a floating exchange rate in 1973. So what's the Haitian dollar? Why are Haitians use it and what are the economic and / or social implications for this? We say that the exchange rate regime is the set of rules that determine the intervention of the monetary authorities of a country or group of countries in the foreign exchange market. Current exchange rate regimes are varied but are distributed between two extremes: the fixed exchange rate and floating exchange rate. A monetary system of fixed exchange rates is said when a monetary authority of a country, a central bank assigns a fixed exchange parity between its currency and another currency (or a set of other currencies). In the monetary regime said floating exchange rate, the exchange rate between two currencies is determined freely depending on the interplay of supply and demand of these currencies on the foreign exchange market. The foreign exchange market, called FOREX (Foreign Exchange market) is where the various transactions between the currencies of different countries is carried out. It was in 1944 that the Bretton Woods conference organized the international monetary system on a fixed exchange rate with the US dollar as the reference currency. All currencies were pegged to the dollar, which itself was tied to gold at a fixed exchange rate. Economically, this meant a great economic agents' confidence in the dollar and that the federal budget deficit never becomes. But about two decades later, international trade has grown, economic agents demanded more cash and the US recorded its first budget deficits. Then some countries have started to adopt the floating exchange while some currencies have strengthened. In 1973, the Kingston Conference devoted floating exchange rate regimes as of organization of the international monetary system. And though the dollar remained a strong currency, it is no longer traded at a fixed rate against other currencies. Back on topic ... What was going on in Haiti at that time? The relationship between the gourde and the US dollar has always been unstable. We all remember very well that famous period of Haitian history under the presidency of Sylvain Salnave when our currency was called "zorèy bourik" because the dollar traded against 1000 units of gourde. It's May 19, 1913, following a period of depreciation of the gourde against the dollar that the Haitian government and the US government agreed to establish parity gourde-dollar exchange rate to five (5) gourdes for one dollar. This exchange rate was applied until the mid-80's. The years that followed saw the exchange rate of the gourde against the dollar vary upward, away from the fixed parity, never to return to his normal level, the global macroeconomic framework helping. This impelled the Haitian government to align then with the decisions of the Kingston Agreement passed some years earlier by adopting a system of flexible exchange rates. One can imagine that today, 35 years later, Haitians are still used to exchange five (5) gourdes for one (1) dollar. The US dollar was no longer exchangeable at that "traditional" rate, the new unofficial motto became known as "Haitian dollar" and is commonly used by the population. Following this trend, some companies have not nested. 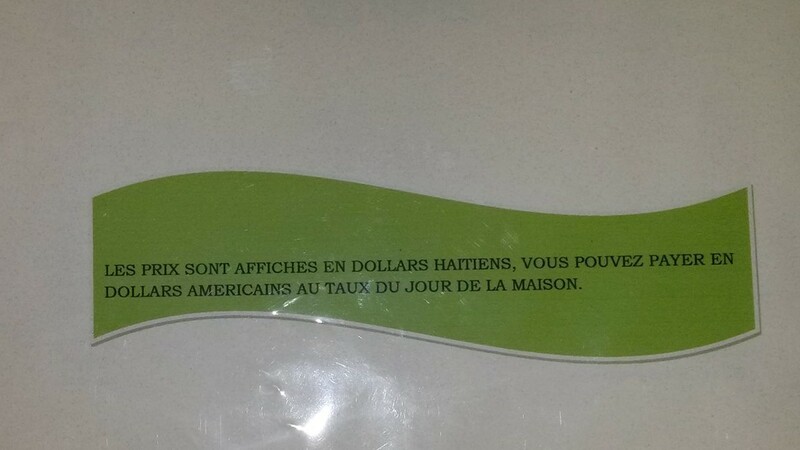 It became common to see prices listed in Haitian dollar in restaurants, supermarkets and other businesses. The transactions in traditional commodity markets are made in gourdes but prices are often labeled and designated Haitian dollar. Many people say they have their money in Haitian dollar. Without wishing to dramatize, we will say that this is already a problem with communication. If the state must guarantee free competition in markets, there is an aspect that must be emphasized: information. Without citing theories about the consequences of information asymmetries on competition, let's just say that competition is not perfect when agents do not have the same information or that the information that they have is not understood in the same way by all of them. Theoretically, it is not known whether there is a threshold where the average Haitian citizen is forced to appeal to the notion of "Haitian dollar" in order to feel comfortable with the number gourde before him, but we will say that if this threshold exists, it could greatly hinder the clarity of a communication about gourde. For example, when talking about a budget of 3,500,000 (three million and five hundred) gourdes on the radio or in any media, what portion of the audience understands and is able to assess normally this figure in terms of real value? For some people, the Haitian dollar is useful when you arrive in 1, 100 gourdes’ units. 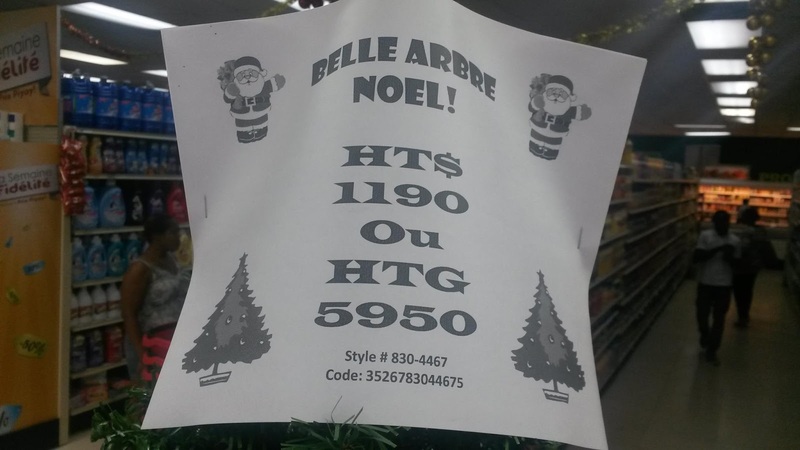 For example, it would be easier to understand if a product costs 3,573 Haitian dollar than 17,865 gourdes. Therefore, it could be that the price of a product displayed in Haitian dollar seems cheaper than if displayed in gourdes. Other consequences may result from this situation but especially for uninformed foreigners and tourists visiting Haiti. They may pay in US dollar products labeled in Haitian dollar. So do you think that we should fight the Haitian dollar? …..